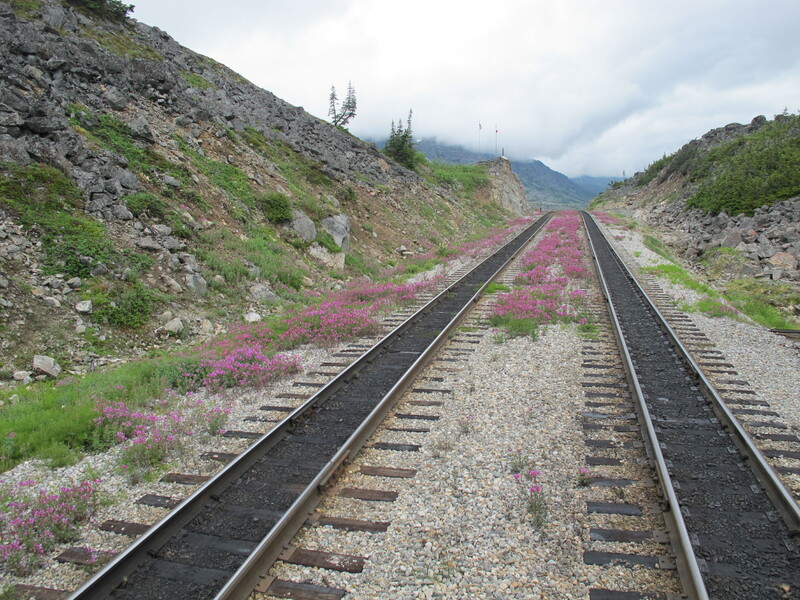 The train tracks from Alaska into Canada. I am lucky enough to now be blogging for Facing Cancer Canada, which gives me an outlet to talk very much to the cancer community. “It won’t always be about cancer,” I told Chantal, my contact there. “My life is not all about cancer.” She understood, and actually encouraged me to simply write what moves me, as they want to show all sides of the cancer experience. In it, after it, through it. This is my second blog post. We’re a posse that understands the meaningfulness of firsts. First time in the infusion lab. First tug and eerie release of your here-to-fore sturdy hair. First time hearing the solid “thunk” of the door closing as everyone flees the radiation room, yet you are left behind. So many firsts. So many difficult firsts. But life has a way of evening things out. The pendulum swings back. The trick, it seems, is to catch it and go for a new ride. Take a chance. Try something new. I am now on the side of more pleasant firsts, thankfully. Like this past weekend, I was part of a gala event called Truth Be Told for the Premiere Oncology Foundation in Santa Monica, California. I was invited as a storyteller, along with 10 other cancer survivors, to put a face on this disease. I grabbed, and I swung. I mean, I’m not a professional speaker. I like speaking. Do it a lot, actually, every day. But not on stage. And certainly not alone, without notes or a podium. Terrifying? You bet. But so amazingly juicy to force myself to push through my comfort zone. Not only did I get to simmer for 2 days with some soulful people, but I got to share my work with the audience, and ask them to consider the importance of including our kids in our cancer treatment. In other words, saying yes to opening myself up to strangers allowed me to further a discussion that I am passionate about. Life is just a series of firsts, punctuated by long stretches of the same old, same old. For cancer patients, saying yes is part of the treatment. We have to agree to some protocol and move forward. But having an enthusiastic “Sure!” to what comes after we’re all finished with our doctor visits, that is part of the wisdom borne of a cancer diagnosis.